Witty, sassy, and ready for action! From beat cop to bobble head! Dexter's little sister! From the hyper-popular CBS/Showtime TV series Dexter, comes Debra Morgan… as a 7-inch tall, resin bobble head! Dexter's smart-aleck sister is not afraid to get into the action as a homicide detective, and she comes dressed to kill (so to speak) with a gun belt in tow. Produced by Bif Bang Pow!, this sassy detective is not to be messed with… you know who she's related to! 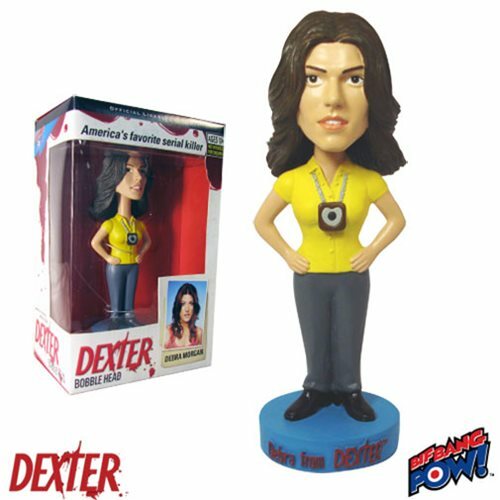 Debra makes a terrific companion piece to the other Dexter bobble heads from Bif Bang Pow! (sold separately).